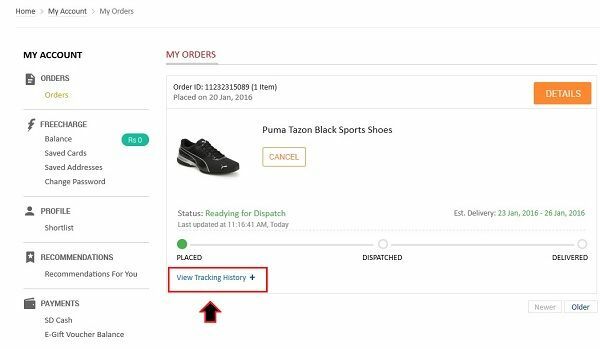 Do you want to know how to track Snapdeal order? If you buy something from an e-commerce company for the first time, then you would be very curious to know about your order status like “When your order is going to be dispatched?”, “At which date you’re going to receive your order” and so many questions. If you want to know the answer to all these questions, then what you need to do is to use “View tracking history” feature. By using this feature you would be able to know the exact location or you can say your order status. Just have a glance at this article to know how to track snapdeal order. Step 1: First login to your snapdeal account by clicking on the “Login” button as shown in the image below. Step 2: In the next step, you need to enter your email address or mobile number with your snapdeal password. Step 3: Now, on the right side of your screen, you may see a “Track Order” option. Just click that option, which will redirect you to “My Orders” page. Step 4: In this section, you may see a small bar, which notifies your delivery status in three section. It turns green when that milestone is achieved. Placed– When you placed any order. Dispatched– When your order is dispatched from snapdeal warehouse. Delivery– Final delivery of your product. 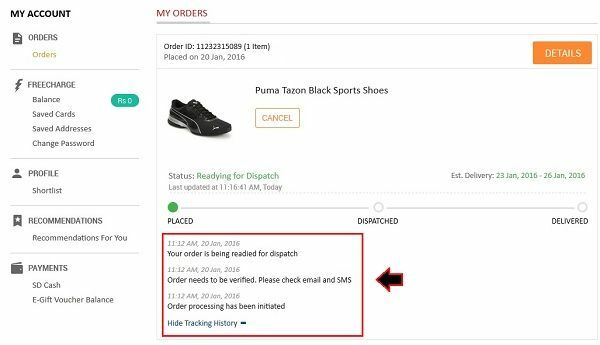 If you want to know more about your order location, then click on “View tracking history” link, as shown in the image below. Step 5: Here, you may see the time and place of your order for tracking purpose.